Is there room for news on Pinterest, and could its latest update help you get readers to pay for stories? 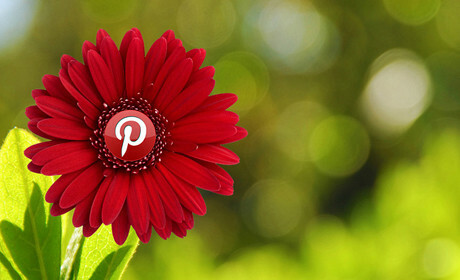 Pinterest has been somewhat harder to crack for publishers than other social networks. Certain boards set up by media outlets after the online pinboard launched five years ago are sparsely populated, but in other corners of Pinterest things have been moving swiftly. The network has become popular among millennials, with a recent study revealing that 36 per cent get news from Pinterest. And while this figure might be dwarfed by the 88 per cent who find news on Facebook, Pinterest is still ahead of Twitter (33 per cent) or Reddit (23 per cent). And in June, Pinterest started introducing a 'buy it' button, allowing users to purchase pinned items. So what does this mean for publishers? If you are already investing time and resources on many networks from Facebook to Instagram to Snapchat, where should Pinterest sit in your social strategy? "When approaching Pinterest [publishers] have to be very mindful that it's… definitely not a dumping ground for everything that they produce," explained Liam Corcoran, head of communications at social analytics platform NewsWhip, in a recent Journalism.co.uk podcast. Here are three opportunities for media outlets to make the most of Pinterest. On Facebook and Twitter, Corcoran explained, the sites that do particularly well would be very familiar and expected – the BBC, BuzzFeed, the Huffington Post or Mail Online. But on Pinterest the picture is very different, with niche blogs outperforming "some of the better known names". So what's their trick? The sites that NewsWhip found to lead the way on Pinterest were focused around specific topics like design, health, cookery, fashion or lifestyle. And the format of the story itself can also make a difference – perhaps unsurprisingly, lists are usually the most successful. BuzzFeed's lifestyle and cookery sections are "extremely strong" on Pinterest, said Corcoran, and other consistently popular stories are Mail Online's coverage of the royal family, and the Huffington Post's own lists as well as op-eds and personal blogs. Corcoran said a first step to building a presence on the platform would be "for more general sites, I think breaking down their sections and figuring out the type of content that they produce already that might be particularly well suited to a Pinterest audience, and making sure that when they present that content on Pinterest that it's accompanied by really, really strong visuals." Recipes and lifestyle blogs might rule Pinterest, but that doesn't mean there's no room for news and sport. "There might just be a different element of those stories that would be better suited to Pinterest, and I'm thinking particularly of strong images that you could put on Pinterest rather than just, you know, copying and pasting a link or putting up a dense piece of text." 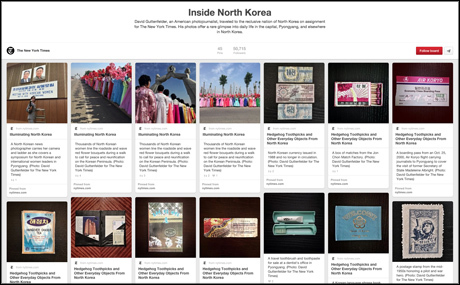 For example, Corcoran pointed to the New York Times's Pinterest board with photographs of daily life in North Korea, a project connected to a series of features the team was publishing on other platforms. Screenshot from The New York Times on Pinterest. "It's just being able to figure out what elements of a story you can pull out and put into a Pinterest collection, and that's kind of the challenge for social media editors when approaching Pinterest," he explained. Pinterest's recent update, including a 'buy' button on individual pins, could also be an interesting proposition for publishers. As more outlets experiment with micropayments, selling individual articles as opposed to monthly subscriptions or a full issue, the chance to showcase a story on Pinterest and offer users the option to buy the article to read more could be a handy option. Ezra Eeman, head of VRT Startup and founder of Journalism Tools, explained that "there is a possibility to use Pinterest as a public version of what Blendle is trying to do in the Netherlands". Eeman has been using Pinterest as one of the main platforms for his Journalism Tools project, alongside Twitter. And as Twitter and Facebook are becoming more oriented towards shorter content types and video, he said Pinterest could become a shop window for longform articles who might get lost in the infinite timelines of other platforms. "Longer publications and different ways of telling stories, they're finding it difficult to have exposure. So Pinterest could be a better way to give exposure to these longer stories and more in-depth reporting." Check out the full podcast for more Pinterest advice.